Can you guess what Zummus is? I bet you can, food lovers. C'mon, set your minds to it...think of two delicious foods and then put them together. 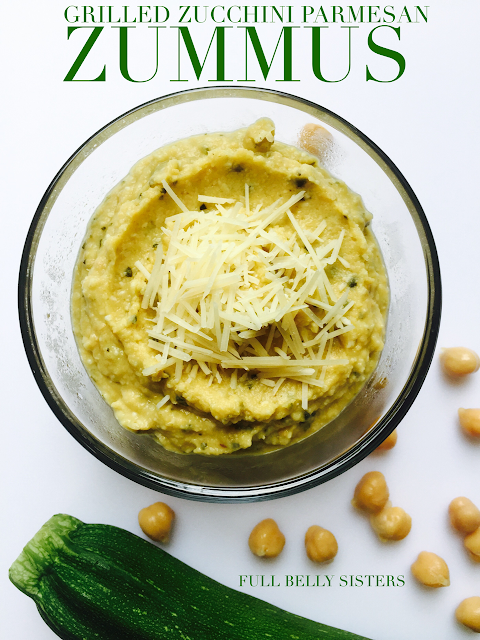 That's right: Zucchini + Hummus = Zummus. My buddy Ann—from the fabulous blog Sumptuous Spoonfuls—made a batch of zummus, loved it, and challenged others to make our own versions. She wants to make "zummus" happen. And it's so good and so simple, I bet we can make it the new foodie craze! I make my Grilled Zucchini throughout the summer—it's simple, tasty, and easy on the wallet. I cook huge platters of it all the time. So, I decided to incorporate some of the leftover grilled zucchini (sans goat cheese and balsamic drizzle) into my zummus. 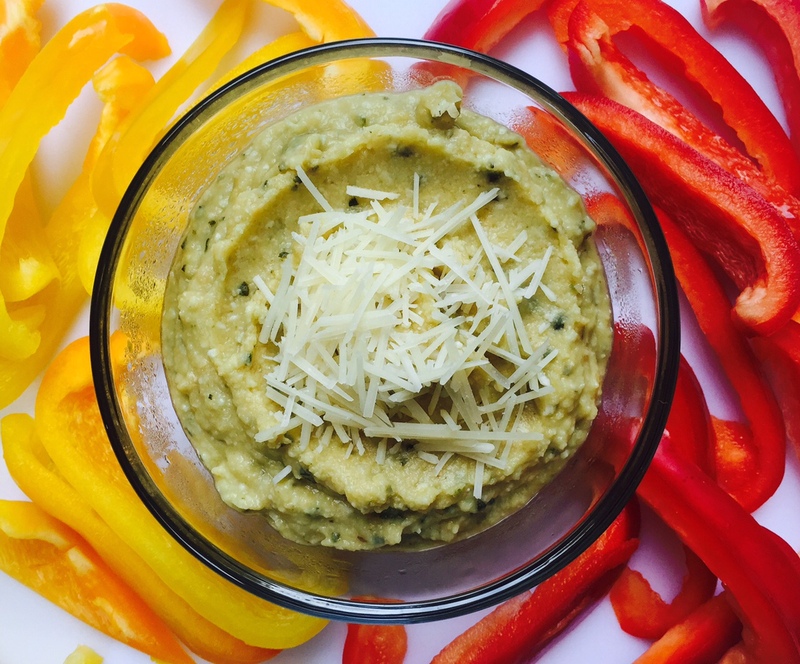 The caramelization you get on the zucchini lends a wonderful smoky, sweet flavor to this dip. If you don't have any grilled zucchini handy, you can certainly substitute some broiled or roasted zucchini for the same effect. As you've probably noticed, I often make foods with Italian ingredients and flavors. For this zummus, I opted to include Parmesan cheese, in lieu of the traditional tahini used in hummus; the Parmesan adds its own nutty flavor and it pairs wonderfully with the grilled zucchini. 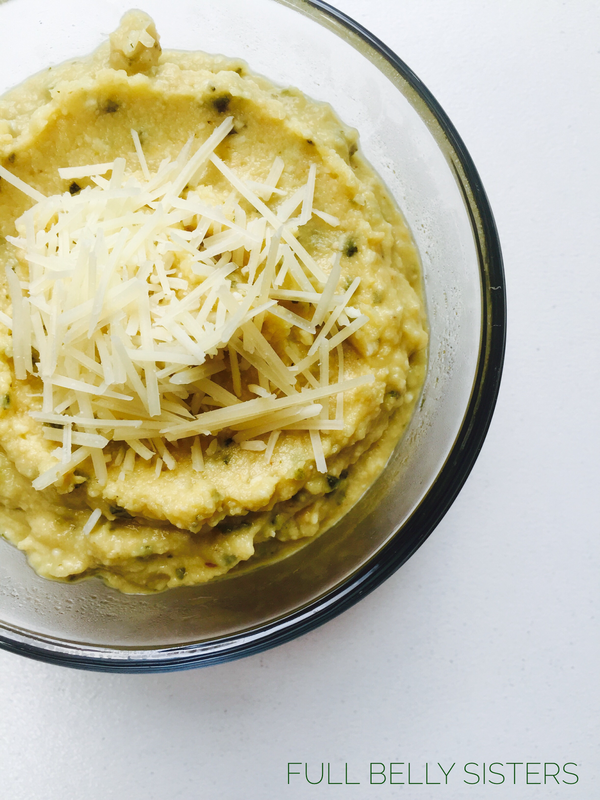 Place the zucchini, chickpeas, Parmesan, garlic, lemon juice, and a pinch of salt into a food processor. Process until the mixture forms a thick paste. Then, continue to process while slowly drizzling in the olive oil until you get the texture you want. It should be very smooth and creamy. Season with additional salt and a pinch of red pepper flakes for some heat. Serve in a bowl and top with additional shredded Parmesan cheese. Serve with raw veggies for a high-protein, grain-free snack! For more zummus recipes, check out Sumptuous Spoonfuls' Zucchini Lima Bean Zummus and Bobbi's Kozy Kitchen's Cilantro Zummus! Sounds delicious! And I love grilled zucchini. I love adding different ingredients to hummus. Never used this combination and it looks wonderful. Love this idea! What a delicious appetizer. I like that you have used Parmesan cheese. We have a glut of courgettes in the back garden so this looks like another perfect way to use some of them up! LOL, you are too cute! Mmmm, this sounds so good! I would love this for lunch today! Firstly, I love the name. Secondly, I love the idea and I have to try this. I love the idea of using zucchini in the hummus, sounds so delicious. Roasted veggies are my favorite way to enjoy them. I love putting some "green veggies" healthfulness in my hummus. This is a "must try" for me. Love the cheesy addition as well. YUM. Roasting veggies gives them such a profound flavor! I love your zummus!